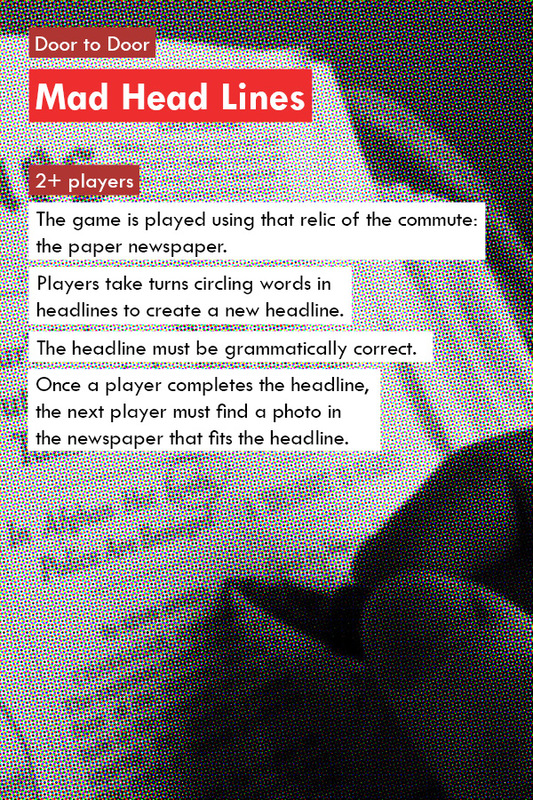 Can we use games to help us experience our commute with fresh eyes? 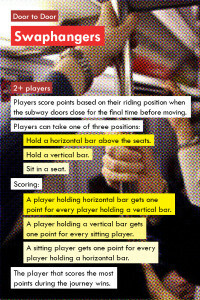 Come experience three different visions for how play can transform the subway system and your structured, repetitious daily commute into something exciting. We invited three game design teams down into the subway system and asked them to create a game that transforms the experience of moving through the city. Join us as we play each game and hear from the designers about the process and challenge of creating play out of a commute. Participants: Josh Debonis and Nik Mikros from BumbleBear Games, game designer Mark Heggen, and Mattia Romeo and Greg Trefry of Gigantic Mechanic. If you’d like to play the games yourself, you can check out the rules below. Download a PDF of the Door to Door game cards.